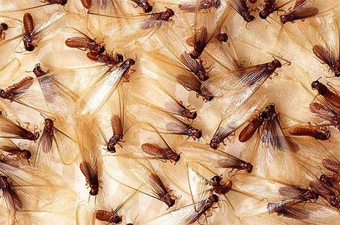 The typically warm, wet weather around Australia lately will see swarms of young termite ‘alates’ – taking flight to search for new locations in which to establish colonies. Many will settle in trees, stumps, fallen logs or fences but some will make themselves at home – in your home! Stagnant sub-floor spaces … remedy this by improving sub-floor ventilation so air can move freely through the space. Timber off-cuts beneath the house … clean them out! Firewood stacked up against the side of the building … relocate it! Dampness under or around a home … install an effective external surface drainage system. A ‘bridged’ damp-proof course, usually caused by landscaping or paving being placed too high … lower it. Regular inspections are also a must, at least once every year. Whilst it can be difficult to prevent a termite attack, the damage bill can be minimised if their presence is detected early. With the average treatment and repair cost estimated to be in the order of $10,000, it’s vital to limit the damage that termites can cause. Finally, if you find termites (or insects you think might be termites) leave them alone and get some expert advice as soon as possible. Disturbing termites will result in them beating a hasty retreat to establish a new colony elsewhere on the property, thereby increasing the likely treatment and repair cost.